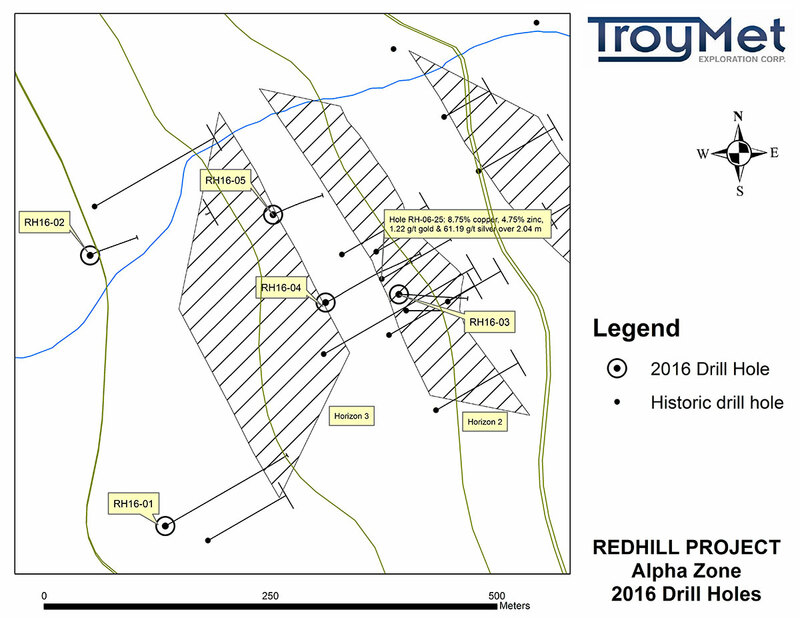 Troymet Cuts New Copper Zone at Red… | Troymet Exploration Corp.
November 15, 2016 - Troymet Exploration Corp. (TSXV: TYE) (“Troymet” or the Company”) is pleased to report the discovery of a significant new zone of copper-rich volcanogenic massive sulphide (“VMS”) on the Alpha zone of the Redhill project in British Columbia.Drilling also intersected the extension of the high-grade mineralization in hole RH-06-25, and demonstrated that the mineralization is relatively shallow and open on strike and to depth. The successful 2015-2016 exploration program has advanced the Redhill project and the Company is looking forward to resuming exploration on the significant targets it has identified. Hole RH16-04 intersected a new, near surface, zone of copper mineralization (“Upper Zone”); Figure 1. The hole, drilled from a platform excavated into the side of a hill, intersected mineralization grading 0.72% copper and 6.5 g/t silver over 6.5 metres, starting at a depth of 5.1 metres. The copper mineralization extends upwards an additional 3.8 metres to the base of the casing; however, because of poor recovery in this interval, a reportable mineralized interval cannot be calculated.Secondary copper mineralization (malachite and chrysocolla) is present in the wall of the drill platform. The downhole width of the mineralized zone is estimated to be in excess of 11.5 metres. Troymet plans to strip, map, trench and sample the mineralization prior to further drilling. Hole RH16-04 also intersected VMS mineralization grading 0.64% copper and 1.5% zinc over 2.0 metres from 206.3-208.3 metres downhole (“Lower Zone”); Figure 2. This intersection is ~20 metres laterally and ~20 metres higher than the mineralization in hole RH-06-25 (8.75% copper, 4.75% zinc, 1.22 g/t gold & 61.19 g/t silver over 2.04 metres). The mineralization in hole RH-06-25 comprises VMS and stringer zone mineralization. The mineralization in hole RH16-04 consists only of VMS mineralization with durchbewegung texture. The mineralization is crudely bedded and dips ~65° to the west. The topography also drops off to the west into a prominent valley. The mineralization is open along strike and to depth, and lies deeper than was tested by previous drilling in the VMS prospect. Additional drilling is required to explore and delimit this significant area of VMS mineralization. The Upper and Lower zones are ~195 metres apart downhole. A 1 metre band (bed?) of massive pyrite was intersected at 161.8 metres. Centimeter-wide bands of pyrite with trace chalcopyrite occur in the overlying and underlying quartz-eye felsic tuffs along with 5-50% disseminated and irregular concentrations of pyrite. The best assay, 0.15% copper and 1.32 g/t silver over 5.0 metres, together with the geology, indicates the potential for the development of significant copper mineralization, off hole, along this horizon. Troymet has identified a characteristic tuffaceous subaqueous ash flow unit, commonly with pyroclastic fragmental textures, that is associated with the VMS mineralization. The unit contains prominent blue quartz “eyes” (phenocrysts) in a matrix composed mainly of feldspar and quartz. Mafic minerals are minimal. The recognition of this important unit will guide future exploration. Widths presented in Table 1 are downhole core lengths; true widths cannot be reliably estimated at this time. Core samples were analysed at ALS Global, Vancouver. Hole RH16-03 was drilled, in part, to twin hole RH-05-23 and to test for shallow mineralization. The best intersection (0.29% copper and 1.2 g/t gold over 1.0 metre from 33.8-34.8 metres downhole) was obtained from pyrite stringer mineralization. The high-grade mineralization in hole RH-05-23 (2.08% copper and 7.5 g/t gold) was also obtained from pyrite-chalcopyrite stringers but from ~45 metres deeper. As in the case of the intersections in holes RH16-04 and RH-06-25, this indicates the better mineralization lies deeper than was previously tested by drilling on the VMS prospect. A new mineralized horizon of bedded pyrite with felsic clasts (cm) as xenolithsin the sulphide was intersected from 8.9-11.3 metres. In the overlying quartz-eye felsic tuff (6.0-8.9 metres) pyrite veins/veinlets (mm – 2 cm) constitute ~ 30% of the core. Copper (255-405 ppm) and silver (1.33-3.62 g/t) are elevated. Along strike or at depth, this mineralized horizon may host significant copper mineralization in this productive environment. Hole RH16-05 tested a newly identified chargeability anomaly (+/- 100 metre depth), and a copper- and zinc-in-soil anomaly, on Horizon 2. The hole, drilled ~100 metres north of the VMS prospect, cut a sequence of quartz-eye felsic tuffs with variably developed pyrite (+ pyrrhotite) as stringers, disseminations and bands to ~30%. While the geology appears to be similar to that in the VMS prospect no copper, zinc or precious metal mineralization was intersected. Hole RH16-01, drilled ~350 metres southwest of the VMS prospect to test a large >20 millisecond chargeability anomaly on Horizon 3, identified pyrite as stringers, disseminations and bands (to ~60%) in intermediate volcanics as the source of the anomaly. The best assay was 0.08% copper over 0.7 metres. This hole was probed with a Volterra borehole electromagnetic survey; no conductors were identified. Following completion of the drill program it is now recognized that the favourable and prospective VMS geology occurs stratigraphically below this horizon. Hole RH16-02, drilled to test a chargeability anomaly on Horizon 3, intersected pyritic felsic volcanics. Local intervals, up to 7.0 metres in width, contain increased concentrations of pyrite including bands/seams to 5 cm which are anomalous in copper (to 0.33% over 1.0 metres), and also carry elevated zinc values (to 621 ppm). This mineralization is interpreted to be distal to more significant accumulations of VMS mineralization. Breccia boulders containing massive sulphide blocks representing slump features and/or mechanically transported mineralization have been found in this locale. Their source has not been found. Further drilling is required to evaluate this area. Downhole TEM surveys are planned prior to further drilling. Troymet has now received the final data for the electromagnetic (“EM”) and induced polarization (“IP”) surveys on the Beta target.The IP survey identified a new, large chargeability anomaly associated with the 40 mho Beta target which is located on a 550 metre long EM conductor. The Beta target, the chargeability anomaly, and the host conductor have never been drilled. The Beta target Is located 200 metres south of borehole S83-4 (2.54% copper, 2.78% zinc, 77.0 g/t Ag, and 0.37 g/t Au over 7.75 metres; see news release of October 25, 2016). The Company plans to drill test this target as part of the next drill program.